A waste collector was forced to quickly dump the rubbish which had just been collected onto the ground after it caught fire inside the truck. In the dramatic video, the driver can be seen stopping the vehicle in order to deposit the waste which was about to start a huge blaze inside. 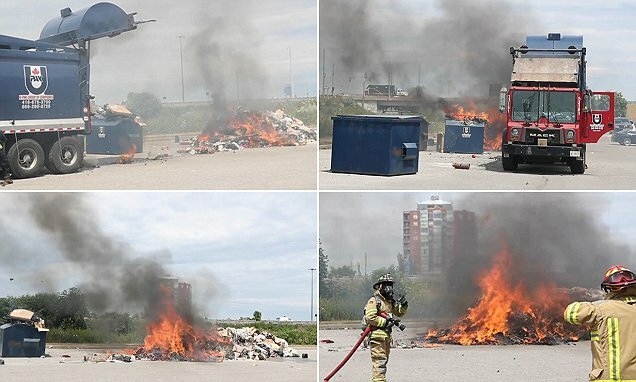 A 30ft-long pile of waste was dumped on the concrete and the fire kept burning with dark thick plumes of smoke billowing into the air in Pickering, Ontario, Canada. Firefighters quickly attended the scene and used powerful hoses to extinguish the inferno.